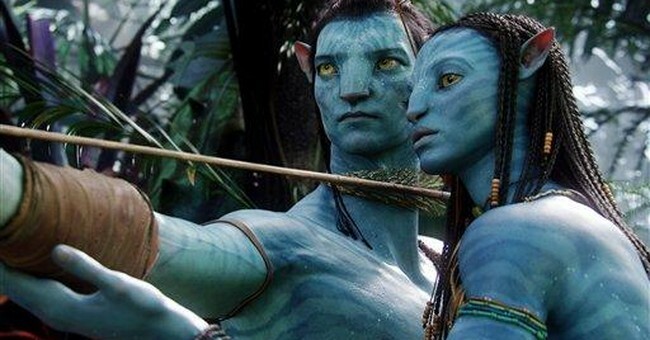 You probably don't need a long synopsis of James Cameron's half-billion-dollar epic "Avatar," in part because even if you haven't seen it, you've seen it. As many reviewers have noted, Cameron rips off Hollywood cliches to the point you could cut and paste dialogue from "Pocahontas" or "Dances With Wolves" into "Avatar" without appreciably changing the story. In short, "Avatar" tells the tale of a disabled Marine, Jake Sully, who occupies the body of a 10-foot-tall alien so he can live among the mystical forest denizens of the moon world Pandora. Sully is sent in mufti, like a futuristic Lawrence of Arabia, to further the schemes of the evil corporate nature-rapists desperate to obtain the precious mineral "unobtainium" (no, really). Jake inevitably goes native, embraces the eco-faith of Pandora's Na'Vi inhabitants and their tree goddess, the "all mother," and rallies the Pandoran aborigines (not to mention the Pandoran ecosystem itself) against the evil forces of a thinly veiled 22nd-century combine of Blackwater and Halliburton. The film has been subjected to a sustained assault from many on the right, most notably by Ross Douthat in the New York Times, as an "apologia for pantheism." Douthat's criticisms hit the mark, but the most relevant point was raised by John Podhoretz in the Weekly Standard. Cameron wrote "Avatar," says Podhoretz, "not to be controversial, but quite the opposite: He was making something he thought would be most pleasing to the greatest number of people." What would have been controversial is if -- somehow -- Cameron had made a movie in which the good guys accepted Jesus Christ into their hearts. Of course, that sounds outlandish and absurd, but that's the point, isn't it? We live in an age in which it's the norm to speak glowingly of spirituality but derisively of traditional religion. If the Na'Vi were Roman Catholics, there would be boycotts and protests. Make the oversized Smurfs Rousseauian noble savages and everyone nods along, save for a few cranky right-wingers. I'm certainly one of those cranky right-wingers, though I probably enjoyed the movie as cinematic escapism as much as the next guy. But what I find interesting about the film is how what is "pleasing to the most people" is so unapologetically religious. Nicholas Wade's new book, "The Faith Instinct," lucidly compiles the scientific evidence that humans are hard-wired to believe in the transcendent. That transcendence can be divine or simply Kantian, a notion of something unknowable from mere experience. Either way, in the words of philosopher Will Herberg, "Man is homo religiosus, by 'nature' religious: as much as he needs food to eat or air to breathe, he needs a faith for living." Wade argues that the Darwinian evolution of man depended not only on individual natural selection but also on the natural selection of groups. And groups that subscribe to a religious worldview are more apt to survive -- and hence pass on their genes. Religious rules impose moral norms that facilitate collective survival in the name of a "cause larger than yourself," as we say today. No wonder everything from altruism to martyrdom are part of nearly every faith. The faith instinct may be baked into our genes, but it is also profoundly malleable. Robespierre, the French revolutionary who wanted to replace Christianity with a new "age of reason," emphatically sought to exploit what he called the "religious instinct which imprints upon our souls the idea of a sanction given to moral precepts by a power that is higher than man." Many environmentalists are open about their desire to turn their cause into a religious imperative akin to the plight of the Na'Vi, hence Al Gore's uncontroversial insistence that global warming is a "spiritual challenge to all of humanity." The symbolism and rhetoric behind Barack Obama's campaign was overtly religious at times, as when he proclaimed that "we are the ones we've been waiting for" -- a line that could have come straight out of the mouths of Cameron's Na'Vi. What I find fascinating, and infuriating, is how the culture-war debate is routinely described by antagonists on both sides as a conflict between the religious and the un-religious. The faith instinct manifests itself across the ideological spectrum, even if it masquerades as something else. On the right, many conservatives have been trying to fashion what might be called theological diversity amid moral unity. Culturally conservative Catholics, Protestants and -- increasingly -- Jews find common cause. The left is undergoing a similar process, but the terms of the debate are far more inchoate and fluid. What is not happening is a similar effort between left and right, which is why the culture war, like the faith instinct, isn't going away any time soon.